UC Santa Cruz has five dining halls, 11 coffee shops and four coffee kiosks, but there are still stretches of campus without food options. In response, campus officials enlisted the help of a mobile food force — food trucks. 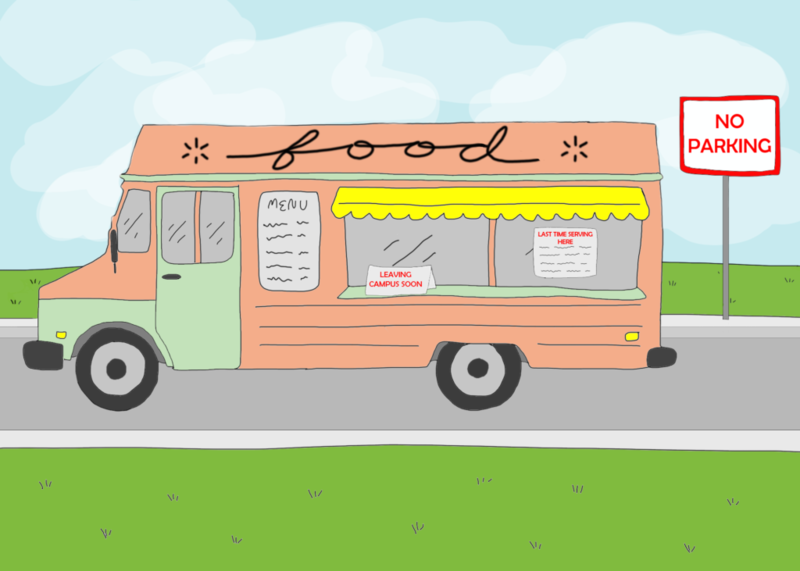 Despite being convenient and cost-effective, food trucks are hard to keep on UCSC’s campus. The trucks service so-called “food deserts,” but there isn’t always enough foot traffic to support them. Looking to fill the gaps between food sources on campus, UCSC Real Estate Services formed an ad hoc food truck committee in 2017. An interdisciplinary group of UCSC faculty sit on the committee. By September 2018, the committee’s efforts won UCSC the presence of Drunk Monkeys and El Buen Taco, assigning them to rotate between the Coastal Sciences Center (CSC) and the Digital Arts Resource Center (DARC) parking lot. Alongside the long-standingpresent Cruz N Gourmet and Raymond’s Catering, the new vendors would help feed a hungry campus. Space constraints on campus aren’t easily solved. It’s difficult to find a parking spot on campus, especially for vehicles that take up two to three times the are of a normal car. Food trucks have to fit into a space that complies with fire codes and doesn’t obstruct traffic or wheelchair accessible sidewalks. These regulations prevent on-campus vendors from circulating freely. The committee assigns designated locations, days and time slots in which each food truck can sell their food, which further restricts their mobility. Unable to meet their customer quota and prevented from leaving their unprofitable spots at the DARC and CSC, El Buen Taco terminated its license five months after it was issued. Meanwhile, business boomed at J. Baskin and Science Hill, where Cruz N Gourmet and Ramond’s Catering food truck vendors sell their food. The new food truck vending locations at DARC and CSC buildings, however, receive less foot traffic. As a result, vendors said the DARC and CSC parking lots don’t get enough customers to support a business. Drunk Monkey’s food truck vendor Damien Zewoken serves 30-45 people a day in the DARC parking lot even though his self-reported service capacity is 200. Food trucks are beneficial to penny-pinching students and faculty. Dollar value matters in Santa Cruz, a city where rental rates are high and the average cost of a lunch is $15 per person. The food truck committee doubled the number of food trucks on UCSC’s campus within the last two years. Members hope to continue building off the momentum of their recent efforts to better serve both students and food truck owners in the future.